To understand why Republicans and Democrats remain far apart in averting automatic across-the-board spending cuts set for Friday, look no further than their last deal. The agreement enacted Jan. 2 to avoid most of the so-called fiscal cliff's big revenue increases and spending cuts raised taxes by $620 billion over 10 years, mainly by letting temporary tax cuts expire. Those tax increases have become bargaining chips taken off the table, which makes it more difficult for lawmakers to address other contentious fiscal issues, such as fresh spending cuts and an overhaul of the U.S. tax code. The deal on the fiscal cliff "actually did hurt the chances of future reform because both sides feel they gave too much and don't want to give more going forward," said Roberton Williams, a fellow at the Tax Policy Center, a joint venture of the Brookings Institution and Urban Institute. The deal "will lead members of Congress to hold their positions even more strongly, leaving compromise even less likely than before." The fiscal-cliff deal postponed until Friday the across-the-board cuts, known as the sequester, that would shave $85 billion from federal spending through Sept. 30. President Barack Obama and congressional Democrats want to replace the sequester cuts with a combination of new tax revenue and additional, though more-targeted, spending reductions. But most Republican lawmakers rule out raising taxes again. Democrats "just got the revenue package you wanted—now you are going to have cuts and no revenue," said Rep. Tom Cole (R., Okla.), a member of the House GOP leadership, referring to the January deal. Democrats counter that recent tax increases are a fraction of the deficit reduction lawmakers adopted in the past couple of years. The rest—roughly $2 trillion over the coming decade—comes from spending cuts, Democrats say. "All we're saying is there should be a balanced plan to avert the sequester," said Drew Hammill, a spokesman for House Democratic Leader Nancy Pelosi of California. Lawmakers' hopes of overhauling the tax system this year have also become more difficult to fulfill. Republicans and some Democrats want to lower tax rates and offset the revenue loss by curbing tax breaks, so that the overall plan doesn't affect the deficit. Mr. Obama in the past has suggested lowering rates and limiting deductions, but lately has emphasized the need to raise revenue to shrink the deficit. But after promising to block any more tax increases, Republicans may have a harder time voting to limit or end tax breaks as part of any compromise. And after fighting to raise the top individual income-tax rates in January, Mr. Obama may be reluctant to lower rates. By raising the top individual tax rate to 39.6% from 35%, the January deal also means Republicans would have to generate a lot more revenue to achieve their goal of lowering top rates to as little as 25% while not widening the deficit. "Clearly, politically the dynamics are harder now, because the individual rates have gone up," said Rep. Kevin Brady (R., Texas), a member of the House leadership. The agreement over the fiscal-cliff included several limits on tax breaks that lawmakers could have used now to help offset the cost of reducing rates in a tax overhaul. Now, those effectively are off the table. Still, House Ways and Means Chairman Dave Camp (R., Mich.) said Tuesday that he plans to introduce tax-overhaul legislation this year and will still aim to lower the top tax rates to 25%. Some lawmakers say the deal over the fiscal cliff helped the effort for a tax overhaul by clarifying the fate of many temporary tax provisions, such as Bush-era tax rates, most of which were made permanent. Looming debates over the sequester and other budget issues also could spur a tax rewrite. Islamists Gain Momentum in Syria - After U.S. Efforts to Bolster Moderates and Subdue Extremists, Terrorist-Designated Group Gains Ground. Extremists intent on establishing an Islamist state in Syria have gained power within the rebel insurgency, while moderates have lost clout since moves by Washington late last year aimed at the opposite result, U.S. officials and rebel fighters say. Several hundred illegal immigrants have been released from detention centers in Georgia and other states, federal officials confirmed Tuesday. They said the releases were made to cut costs in advance of automatic spending cuts that are scheduled to take effect Friday. Critics immediately accused the White House of gamesmanship in the contentious debate over the across-the-board spending cuts, called sequestration. President Barack Obama and Congress have long been at odds over how to handle deficit reduction. Republican U.S. Sen. Saxby Chambliss [said]: “This decision by the Obama administration is just another example of the White House’s skewed priorities for political gain in the ongoing spending-cuts debate,” he said. While immigration officials occasionally free detainees on supervised release, immigration advocates said that the surge of recent releases — so many in such a short span of time — was extraordinary. Senator Jeff Sessions, Republican of Alabama, a senior member of the Senate Judiciary Committee, which is also holding immigration hearings, said the releases “lessened the chances” that legislators might reach a bipartisan accord on comprehensive immigration reform. Other Republicans, however, shrugged off the releases, saying they expected that the administration would use the excuse of sequestration to take attention-grabbing action and that they were prepared for more in the coming days. MUCH OF WHAT President Obama hopes to accomplish in his second term would tap into what’s known as the “discretionary budget” — money not already claimed by entitlement programs such as Medicare and Social Security. But the discretionary budget itself is about tapped out, squeezed by the growth of entitlement spending. That’s what makes the minimal presidential leadership on entitlement reform so baffling. This week Washington is having a stupid fight over a stupid budget issue. The so-called sequestration of $85 billion in federal spending would weaken the economy just as an increase in the payroll tax appears to be giving consumers pause. It would force the government to make mindless cuts across the board, instead of allowing reasoned choices. According to Mr. Obama’s senior military advisers, it would endanger national security. Yet nobody seems inclined to prevent it. In the petty arguments over this self-inflicted wound, there are merits, or demerits, on both sides. The Republicans are right when they say that the sequester was Mr. Obama’s idea, in the summer of 2011, and that he agreed to a deal that was all spending cuts, no tax hikes. He is correct that he hoped the sequester would never go into effect but would be replaced by a 10-year bargain that would raise revenue and slow the growth of entitlement costs. He is correct, too, on the larger point: Such a deal is what’s needed, and the Republicans are wrong to resist further revenue hikes. But if that’s what’s needed, why is Mr. Obama not leading the way to a solution? From the start, and increasingly in his second term, Mr. Obama has presented entitlement reform as something he would do grudgingly, as a favor to the opposition, when he should be explaining to the American people — and to his party — why it is an urgent national need. Obama priorities such as health and energy research, preschool education and job training: Those come from the discretionary budget. Yet the $1.4 trillion in spending cuts that Mr. Obama and Congress have agreed to over the past two years all come from the discretionary side. By 2023, if you believe their promises, the government will be spending only 2.8 percent of gross domestic product on defense — compared to a 40-year average of 4.7 percent — and only 2.7 percent on everything else in the discretionary budget, compared to a 40-year average of 4.0 percent. Meanwhile, the three fastest-growing categories of spending will have become the largest categories of spending: Social Security, health care and interest on the swollen debt. Interest alone will have risen from $224 billion this year to an astonishing $857 billion 10 years from now, according to the nonpartisan Congressional Budget Office. What a pathetic waste of taxpayer money. Most Republicans in Congress have been utterly irresponsible in this debate. They pretend that they could balance the budget without more revenue, an arithmetical impossibility, and they have failed to put forward realistic, near-term entitlement reforms. But we take little comfort in Mr. Obama’s being less irresponsible. He is the president; his party colleagues are increasingly intransigent on entitlement reform; and it will be his — and their — progressive goals that suffer most if the nation continues on its current path. Centrist Democrats Hold Possible Cure - .Washington reaches the logical nadir of its current dysfunction at week's end with the arrival of the sequester, an approach to deficit-cutting so mindless that when the idea was hatched just 18 months ago, everyone agreed the two parties would never actually accept it. Washington reaches the logical nadir of its current dysfunction at week's end with the arrival of the sequester, an approach to deficit-cutting so mindless that when the idea was hatched just 18 months ago, everyone agreed the two parties would never actually accept it. And this moment is being met by, well, nothing. The most stunning aspect of the latest budget impasse is that nobody really is scurrying around to prevent it. With the arrival of the sequester's automatic, across-the-board spending cuts, the government is about to go on autopilot. This may not meet the technical definition of a power vacuum, but it comes pretty close. And given that nature abhors a vacuum, eventually something will fill it. Here's a thought about who could—perhaps should—do that: a group of younger, moderate Democrats in the Senate. What Washington badly needs right now are people to serve as a bridge between the two parties. Things have gotten so bad that some congressional Republicans won't even accept invitations from President Barack Obama to attend social events at the White House, the sorts of activities that used to serve as natural lubricants in making the capital work. Moderate and conservative Democrats often have formed this bridge between the parties. They have gone by various labels: Scoop Jackson Democrats in the Cold War era, named after the Washington state hawk who shared GOP views about the Soviet threat; Boll Weevil Democrats in the Reagan era; and Blue Dog and Third Way Democrats since. A similar role has been played by liberal Republicans in the past, but they are essentially an extinct species, particularly in the House, which is the center of GOP power in the capital. Hence the opening for moderate Senate Democrats to become the bridge. To define this group, start with the six Democratic senators running for re-election next year from states carried by Republican presidential nominee Mitt Romney: Mark Begich of Alaska, Max Baucus of Montana, Kay Hagan of North Carolina, Tim Johnson of South Dakota, Mary Landrieu of Louisiana and Mark Pryor of Arkansas. Add to the list two senators from swing states also running in 2014, Mark Warner of Virginia and Mark Udall of Colorado. All face voters next year in states where voters either lean red or have limited regard for party labels. All have reason to show they can find middle ground. Throw in West Virginia's Joe Manchin, Missouri's Claire McCaskill, Indiana's Joe Donnelly, North Dakota's Heidi Heitkamp and Montana's Jon Tester, who were elected from red state states last year, and you have 13 Democrats who have either the potential or the need—or both—to break the fever that grips the political system. Within this group are some lawmakers—Mr. Warner in particular comes to mind—who have shown they are itching to break out of the partisan straitjackets holding in both parties. "The reformers willing to challenge orthodoxy in the Senate right now among Democrats are the Young Turks who are less defined by the political spectrum and more defined by pragmatism—what does it take to get things done?" says Mike McCurry, who was President Bill Clinton's spokesman and before that worked for the premier unconventional Democrat of his time, the late Daniel Patrick Moynihan. What does that mean in the current case of the sequester? Washington is falling back to the lowest-common-denominator version of deficit cutting because of what has become the standard problem of the past several years: Republicans want the next round of deficit reductions only through spending cuts, while Mr. Obama wants a mix of new revenue and spending cuts. And on that familiar road, the government is stuck. But the reality is that the two parties' leaders probably aren't as far apart as the sterile rhetoric suggests. Republican leaders have in the past endorsed the very kinds of revenue-producing loophole closings Democrats say they are looking for. Mr. Obama has offered cuts in Democrats' beloved entitlement programs that might provide the grease to get Republicans to sign onto some revenue. But the leaders are stymied right now by their followers. Republicans think they gave all they need on additional tax revenue in the latest budget deal. Rank-and-file Democrats see no need to give ground on entitlements without more revenue to make the medicine go down better. A movement from the ground, at the political center, could produce a breakout. There are two cracks at moving onto a different path. One is now, with the sequester, the other comes at the end of March, when the government's entire funding has to be extended, perhaps with more artful deficit cuts than the sequester allows. Movement in the center, in the Senate, may provide the best way to change the path now being traveled. That reality also underscores what Republicans, and some Democrats, say was a major miscalculation on the part of President Obama. He agreed to set up the automatic cuts 18 months ago because he believed the threat of sharp reductions in military spending would be enough to force Republicans to agree to a deficit reduction plan that included the tax increases he favored. As lawmakers prepared to return to Washington, the White House tried to raise the ante by highlighting the effects the cuts would have on programs in every state. But at the heart of the battle over sequestration — the nearly $1 trillion in budget cuts that are scheduled to begin on Friday and accelerate over the next decade — are fundamental misunderstandings between the two parties over their respective priorities. During the 2011 negotiations to raise the nation’s statutory borrowing limit, Mr. Obama wanted an onerous “trigger” to force both sides to reach a compromise on deficit reduction. For Democrats, the bludgeon that would drive them to negotiate changes to entitlement programs like Medicare and Social Security would be cuts to domestic programs like child nutrition and national parks. For Republicans, the president wanted automatic tax increases to force a compromise on the broader tax code. Republicans balked, but offered what Mr. Obama thought was a different Republican sacred cow — military cuts. Ultimately, taxes trumped all of that. Republicans, who last month let taxes rise on incomes over $400,000 to avert broader tax increases and the “fiscal cliff,” are now ready to stand their ground, regardless of the military cuts. But the Republicans were surprised by Democrats, who would not shift the automatic domestic cuts to entitlement programs unless the people least affected by government support — the rich — also bore some of the burden. Dan Pfeiffer, a senior adviser to Mr. Obama, said on Sunday that there was no miscalculation. In the final months of last year’s presidential campaign, Republicans “racked up a lot of frequent flier miles booking flights to Virginia” to denounce the coming military cuts, he said. If Republican leaders would step out of the way, he said, rank-and-file Republicans most worried about the military cuts would step forward to compromise on taxes. A sizable number of Republicans, including many senators, are incensed by the cuts about to fall on the Pentagon, totaling $43 billion for the 2013 fiscal year. Because the Defense Department will have only seven months to put them into effect and because military personnel are protected, military training, weapons acquisition and maintenance stand to be cut by 13 percent. President Ronald Reagan’s push in the 1980s for tax cuts and domestic spending restraint were accompanied by a huge military buildup. “There’s no way the party of Ronald Reagan should be accepting these cuts,” said Senator Lindsey Graham, Republican of South Carolina, who has privately sought some compromise on tax loopholes. Senator John McCain, Republican of Arizona, called the cuts “unconscionable” on the CNN program “State of the Union” on Sunday. But most Congressional Republicans are standing their ground, a position they say is strategic. The federal government’s growing debt cannot be controlled through the spending at the annual discretion of Congress, and after the cuts take effect, that part of the federal budget will drop to levels not seen in five decades as measured against the size of the economy. Long term, the problem is entitlements, especially Medicare and Social Security. The pain of further cuts to discretionary programs could bring Mr. Obama to the negotiating table on them by the spring, if not by midsummer, when Congress must once again raise the government’s borrowing limit. “Because the Democratic-controlled Senate and the president refuse to negotiate, the only way to potentially bring them to the table to negotiate is to go forward with the spending reductions as they are,” Mr. Price said. With so many rank-and-file Republicans adamant that they would rather see the cuts stand than raise any taxes, Speaker John A. Boehner finds himself in a bind. Three times this year — on the tax deal to resolve the fiscal cliff, on a measure to suspend the debt ceiling and on a package of Hurricane Sandy relief — he has let legislation pass the House against the votes of a majority of Republicans. In 2011, Republicans accepted caps on military spending as well. Each time, the speaker has promised to stand his ground on the next showdown with the president. That showdown comes this week. Representative Tom Cotton of Arkansas, an Iraq War veteran with combat experience and a rising Republican star, said that the speaker was in a “very tough position” in one-on-one negotiations with the president, and that the opportunity for a grand bargain was gone. Cameron McWhirter pens a keeper and reminds me of one from the Cracker Squire Archives and that as of late (and yes, probably more to come) our heritage and history have gotten knocked a bit too much for my liking. 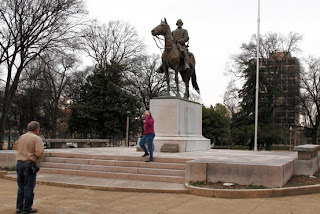 A statue of Nathan Bedford Forrest sits in the Memphis, Tenn., park named for the Confederate cavalryman. It seems as though this guy from Florida – a no-good Yankee carpetbagger no doubt – has got it in his mind to hold a mock lynching of a Confederate flag as part of an art exhibition at a Gettysburg College art gallery early next month. Of all places, Gettysburg, a sacred place where both sides fought valiantly and lost thousands and thousands of lives. I took my three girls there, and hope to take my grandkids there one day just as I look forward to taking them to the Statute of Liberty. Am I glad we changed flags? You dern right I am. We had no choice. Congress could outlaw "white only" signs, but not what the Confederate battle flag based on the St. Andrews cross had come to be – a symbol of rascism and hatred. Unfortunately, to many Americans it conjured up memories of lynchings, the KKK and nightriders, Jim Crowism, etc. It had to go and I am glad it is behind us. Changing it took courage. We won’t hear about it next week, but Sen. Miller almost lost re-election in 1994 as governor for trying to change the flag during his first term. The council made the switch Feb. 5, days after learning of a bill introduced in the Tennessee Legislature that if passed would prohibit renaming any parks or monuments honoring war veterans, including Confederates. The council voted quickly to strip Gen. Forrest's name from the park, as well as change the names of two others, Confederate Park and Jefferson Davis Park, which honored the Confederacy's president. Republican state Rep. Steve McDaniel, a self-described "big-time Civil War buff," proposed his "Tennessee Heritage Preservation Act" because he worried that public parks and monuments honoring American conflicts and their veterans could be renamed or removed by groups that found parts of history distasteful, he said. "If we don't preserve our historic places today, who's going to have them there for our posterity?" he said. In Tennessee and across the South, thousands of communities have named streets, parks and monuments to honor the "Lost Cause." But since the civil-rights movement, disputes have erupted as public views have shifted. Confederate battle emblems have disappeared from several state flags. Street names have been changed. Just last year, the city council of Selma, Ala., halted repairs to a monument to Gen. Forrest after a bust of the general was stolen. While many in the South are proud of Confederate heritage, others see rebel monuments and parks as glorifying the institution of slavery. Gloria Sweet-Love, president of the Tennessee State Conference of the NAACP, said in an interview that Mr. McDaniel's bill was "crazy." Nowhere has the bill caused more uproar than in Memphis, Tennessee's largest city. After learning of Mr. McDaniel's bill, the city council stripped the parks of their Confederate names and set up an advisory committee to find permanent names. In addition to the Forrest Park change to Health Sciences Park, Confederate Park was temporarily renamed Memphis Park and Jefferson Davis Park was renamed Mississippi River Park. Lee Harris, a councilman who led the name-change effort, said fear of Mr. McDaniel's bill becoming law galvanized the council. He said history "is of less importance than making sure our public space is common ground." He said the parks were "not historical at all. What we had was celebration" of the Confederacy. But Becky Muska, who lives near Memphis and has Confederate ancestors, told the council the day it voted to change the park names: "You do not have the right to spin, edit, denounce, slander, revise, tear down, hide [or] destroy my history, because when you do that, you do that to Memphis." Mr. McDaniel said his bill wouldn't be retroactive, so if it passes, the Memphis parks wouldn't revert to their Confederate names. He said he believed it would pass the Republican-controlled Legislature. Ms. Muska said in an interview that she and others are considering suing Memphis. Gen. Forrest is considered one of the Confederacy's greatest cavalry commanders, according to biographer Jack Hurst. But he was also a slave trader before the war and commanded troops involved in a massacre of black soldiers at Fort Pillow, Tenn., in 1864, and was a leader of the Ku Klux Klan after the war, Mr. Hurst said. Lee Millar, Memphis spokesman for the Sons of Confederate Veterans, a Confederate heritage group, said Gen. Forrest was a "very humane" slave trader. He also said the Fort Pillow incident wasn't a massacre and that the KKK under Gen. Forrest was "like a neighborhood watch," not the racist organization that it became later. "Unfortunately, he gets a bad rap by association," Mr. Millar said. Historians disagree. Mr. Hurst said Gen. Forrest was "one of the biggest slave traders in the western South," and slave trading was by definition inhumane. 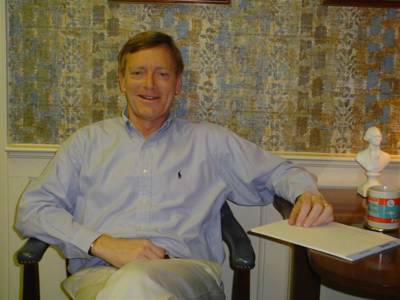 John Cimprich, a history professor who published a book on Fort Pillow, said Gen. Forrest's exact role in the incident is unclear, but black soldiers, many of whom had surrendered, were slaughtered by troops under his command. Mr. Cimprich said Gen. Forrest's KKK involvement remains "the worst thing on his record." "I understand if a local community is not comfortable with a park being named after him," he said. The big sequester gamble: How badly will the cuts hurt? If voters react with a shrug, congressional Republicans will have won a major victory in their campaign to shrink the size of government. Instead of cancelling the sequester, the GOP will likely push for more. With the ax set to fall on federal spending in five days, the question in Washington is not whether the sequester will hit, but how much it will hurt. Over the past week, President Obama has painted a picture of impending disaster, warning of travel delays, laid-off firefighters and pre-schoolers tossed out of Head Start. Conservatives accuse Obama of exaggerating the impact, and some White House allies worry the slow-moving sequester may fail to live up to the hype. In the long partisan conflict over government spending, the sequester is where the rubber meets the road. Obama is betting Americans will be outraged by the abrupt and substantial cuts to a wide range of government services, from law enforcement to food safety to public schools. And he is hoping they will rise up to demand what he calls a “balanced approach” to deficit reduction that replaces some cuts with higher taxes. Adding to the liberal angst is concern that the scale of the cuts may be overstated, at least in the short term. While the sequester orders the White House to withdraw $85 billion in spending authority from affected agencies in the fiscal year that ends in September, the nonpartisan Congressional Budget Office predicts that agencies will reduce actual spending by only about $44 billion, with the remaining cuts carried over into future years. Administration officials insist the pain will be immediate and acute. Though furloughs of federal workers won’t begin in earnest until April, notices could begin rolling out before the March 1 deadline. On Friday, cash-strapped governors and mayors will be notified of cuts to social-service grants and reductions in education funding that will impact the coming school year. And actual federal payouts will decline immediately for at least two programs: Emergency unemployment benefits for the long-term unemployed and nutrition assistance for women, infants and children, known as WIC. Liberals complain that the White House has been slow to raise the alarm. Four months ago, Obama said during the final presidential debate that the sequester “will not happen.” Throughout his reelection campaign, the White House refused to discuss the cuts or plan for their implementation. Last fall, after Congress demanded information, the White House published a thick booklet listing 1,200 affected programs and the amounts they would be cut. But it said nothing about which services would be lost or which offices would be closed — and certainly nothing to scare budget-cutting Republicans about potential harm in their districts. Until a few weeks ago, many public workers who stand to be heavily affected — state public health officials, teachers, police officers — were still not fully aware of the gun to their heads, said Holubowich, who serves as executive director of the Coalition for Health Funding. But then Congress left town for the President’s Day recess and Obama headed to Florida for a long weekend of golf with no talks underway and no prospects for a last-minute deal. “That for me was the moment I realized: Okay, this is going to happen,” Holubowich said. Since then, the White House has been gushing information, meeting with activists such as Holubowich — and, finally, providing some concrete details. On Thursday, the National Parks Service announced that furloughs would curtail services at such popular destinations as Yellowstone, Yosemite and the Grand Canyon. And on Friday, Transportation Secretary Ray LaHood released a list of airfields that could close due to Federal Aviation Administration furloughs. Conservatives were unimpressed. In 1981, President Ronald Reagan “fired more than 10,000 air traffic controllers. There could have been massive disruption. But there wasn’t,” said Chris Edwards, a budget expert at the libertarian Cato Institute. Meanwhile, the screaming from state officials and private industry has also been muted. Governors in Washington for their annual winter meeting bemoaned the cuts, but while Democrats demanded an end to them, Republicans merely asked for more flexibility. House Speaker John A. Boehner (R-Ohio) and Senate Majority Leader Harry M. Reid (D-Nev.), looking ahead to the next major deadline at the end of March, are discussing a compromise that would keep the government open and the sequester in place. That is a question the Supreme Court will consider Wednesday. At issue is whether the guarantee of equality in Alabama, and elsewhere in the South, is the same as in the rest of the nation. The court will review — for the sixth time since passage in 1965 — Section 5 of the Voting Rights Act, which mandates that federal authorities pre-approve any changes in voting laws here and in eight other states and numerous jurisdictions with a history of discrimination. It has survived each previous time. The section is the hammer in what supporters say is the most effective civil rights legislation Congress has ever passed. They draw a straight line between the law and the election of the nation’s first African American president. Those seeking to overturn Section 5 say it was once vitally needed and is now hopelessly outdated. “The violence, intimidation, and subterfuge that led Congress to pass Section 5 and this court to uphold it no longer remains,” says the challenge filed by Shelby County, Ala., a fast-growing, mostly white suburb south of Birmingham. It is fitting the test case comes from Alabama, where bloody resistance to African Americans’ voting rights was “particularly responsible” for making Section 5 necessary, the state concedes in its supporting brief to the Supreme Court. Governors of both parties said on Saturday that they knew federal budget cuts were coming, and they pleaded with President Obama and Congress to give them more discretion over the use of federal money so they could minimize the pain for their citizens. The governors put aside their partisan disagreements and united in sending an urgent message to Congress. First the White House and Congress created a potential fiscal crisis, agreeing more than a year ago to once-unthinkable governmentwide spending cuts in 2013 unless the two parties agreed to alternative ways to reduce budget deficits. Now that those cuts are imminent — because compromise is not — they have created one of Washington’s odder blame games over just whose bad idea this was. What makes this debate over blame so odd is that both sides’ fingerprints — and votes — are all over the sequestration concept. The point of sequestration, in fact, was to define cuts that were so arbitrary and widespread that they would be unpalatable to both sides and force a deal. Brooks: Sequestration would have seemed insane in days gone by. But politicians in both parties are secretly discovering that they love sequestration now. [P]ut politicians in both parties are secretly discovering that they love sequestration now. It allows them to do the dance moves they enjoy the most. Democrats get to do the P.C. Shimmy. Traditional presidents go through a normal set of motions: They identify a problem. They come up with a proposal to address the problem. They try to convince the country that their proposal is the best approach. Under the Permanent Campaign Shimmy, the president identifies a problem. Then he declines to come up with a proposal to address the problem. Then he comes up with a vague-but-politically-convenient concept that doesn’t address the problem (let’s raise taxes on the rich). Then he goes around the country blasting the opposition for not having as politically popular a concept. Then he returns to Washington and congratulates himself for being the only serious and substantive person in town. Sequestration allows the White House to do this all over again. The president hasn’t actually come up with a proposal to avert sequestration, let alone one that is politically plausible. He does have a vague and politically convenient concept. (Tax increases on the rich!) He does have a chance to lead the country into a budget showdown with furloughed workers and general mayhem, for which people will primarily blame Republicans. And he does have the chance to achieve the same thing he has achieved so frequently over the past two years, political success and legislative mediocrity. Republicans also secretly love the sequester. It allows them to do their favorite dance move, the Suicide Stage Dive. It was pioneered by Newt Gingrich in 1995 and has been repeated constantly since. In this dance, the Republicans mount the stage and roar that they are about to courageously cut spending. In this anthem they carefully emphasize cuts to programs the country sympathizes with, such as special education, while sparing programs that actually created the debt problem, like Medicare. Then, when they have worked themselves up into a frenzy of self-admiration, they sprint across the stage and leap into what they imagine is the loving arms of their adoring fans. When they are 4 feet off the ground, they realize the voters have left the building in disgust and they land with a thud on the floor. Sequestration allows the Republicans to do the Suicide Stage Dive to perfection. Voters disdain the G.O.P. because they think Republicans are mindless antigovernment fanatics who can’t distinguish good government programs from bad ones. Sequestration is a fanatically mindless piece of legislation that can’t distinguish good government programs from bad ones. Sequestration carefully spares programs like Medicare and Social Security that actually contribute to the debt problem. Sequestration will cause maximum political disgust for a trivial amount of budget savings. So, of course, the conservative press is filling up with essays with titles like “Learning to Love Sequestration.” Of course, Republican legislators are screwing up their courage to embrace it. Of course, after the cuts hit and the furor rises, they are going to come crawling back with concessions as they do after every Suicide Stage Dive. These two dance moves, the P.C. Shimmy and the Suicide Stage Dive, when combined, are beautifully guaranteed to cause maximum damage to the country. What’s America’s biggest problem right now? It is that business people think that government is so dysfunctional that they are afraid to invest and spur growth. So what are the parties going to do? They are going to prove that government is so dysfunctional that you’d be crazy to invest and spur growth. In a normal country, the politicians would try some new moves. For example, if they agreed to further means test Medicare they could save a lot of money. Democrats would be hitting the rich. Republicans would be reforming entitlements. But no. Both parties love their current moves. The above column was written in a mood of justified frustration over the fiscal idiocy that is about to envelop the nation. But in at least one respect I let my frustration get the better of me. It is true, as the director of the Congressional Budget Office has testified, that the administration has not proposed a specific anti-sequester proposal that can be scored or passed into law. It is not fair to suggest, as I did, that tax hikes for the rich is the sole content of the president’s approach. The White House has proposed various constructive changes to spending levels and entitlement programs. These changes are not nearly adequate in my view, but they do exist, and I should have acknowledged the balanced and tough-minded elements in the president’s approach. How Federal Spending Would Be Cut Under the Sequester - $85 billion? That sounds like a lot of money. How does this compare with the size of the government's budget? The government spent $3.538 trillion in the fiscal year that ended in September 2012. So $85 billion is 2.4% of the federal budget. What's unusual about the sequester, though, is that some of the largest programs in the federal budget are exempt. That means the cuts are concentrated on a smaller pool of government programs. On March 1, $85 billion in across-the-board federal spending cuts—known in Washington parlance as the sequester—are set to begin, prompted by a 2011 law designed to reduce the government's budget deficit. Here are answers to some commonly asked questions about how it would work, assuming it takes effect as scheduled. Where did the sequester come from? The sequester was one result of the deficit-reduction deal struck by the White House and Congress in the summer of 2011, which also raised the government's borrowing limit, and fits within Washington's broad yet stuttering efforts to bring the budget deficit down to levels most economists consider sustainable. Republicans wanted significant spending cuts as a condition for voting to raise the debt ceiling. The parties agreed to raise the debt ceiling and implement new caps on spending for 10 years, which would save $917 billion. Both sides knew they would need more deficit reduction to win Republican support. So the White House proposed a process aimed at forcing lawmakers to craft a deal over the next 16 months. First, they would create a congressional "supercommittee" with members from both parties to hammer out a deal to reduce the deficit by another $1.2 trillion over roughly a decade. The White House proposed a trigger called the "sequester" that would kick in if the committee failed and no other comparable deficit-reduction plan was reached. The idea was that the sequester would be so dreadful it would force the two parties to reach a deal. Democrats and Republicans agreed to essentially split the spending cuts between defense and non-defense programs over nine years, beginning in 2013, and members of both parties voted for the plan. The supercommittee failed to reach a deal. Now, while members of both parties agree the sequester is a bad way to reduce spending, they still can't agree on a substitute. What happens on March 1? The impact likely wouldn't be felt immediately because the agencies would have to adjust their budgets. Many of the cuts wouldn't take place until weeks or months later. Many federal agencies would begin informing roughly one million civilian employees that they could soon be forced to take unpaid leave, one day per week perhaps. These furloughs likely won't begin until around April. Federal agencies affected also would send letters to contractors and state and local officials informing them of the cuts. They could detail the size and extent of the reductions over the remaining seven months of the federal fiscal year, which ends Sept. 30. That could in turn force a state governor who receives federal aid or a contractor with government business to reevaluate their own budgets and inform employees or subcontractors of their own cuts. It could take a while for the ripple effect to spread. Which agencies and programs are affected? Most agencies would be affected, but a large number are exempt. Those affected by the cuts include the departments of energy, state, defense, labor, transportation, justice and the National Institutes of Health. Among those exempted are the Federal Reserve and the U.S. Postal Service, which have revenue sources outside the federal budget; benefits paid by the Social Security, Medicare and Medicaid programs; and military pay for uniformed personnel. How will spending be cut? First, agencies would cut back on spending such as travel and filling vacant positions, seeking to minimize the impact. Many agencies would further reduce labor costs through the furloughs. For example, the Federal Aviation Administration has said it could force all of its 47,000 employees, including air traffic controllers, to take unpaid leave for a certain period. The Social Security Administration said the cuts could mean it takes longer for Americans to file retirement and disability claims, and the Internal Revenue Service has said they could complicate the April tax filing season. How will the cuts be allocated? The cuts will be split among around 1,200 different federal programs, and then extended to tens of thousands of subprograms and projects. The reductions would be split into three broad categories. 1) Defense spending, which includes Pentagon and defense intelligence spending, accounts for half the sequester cuts. Many of these programs will be reduced by roughly 13% over seven months. 2) Non-defense spending. This would include housing, education, or transportation programs. 3) Medicare. There will be a 2% cut in the payments to Medicare providers, such as hospitals and doctors. Do the cuts have to be spread evenly over the remaining seven months? Not necessarily. Agencies will have the flexibility to apportion the cuts as they see fit over time. But they will likely try to spread them out as much as possible, believing that the impact will be less concentrated. Also, while the sequester cuts the agencies' "budget authority" by about $85 billion between March 1 and Sept. 30, actual outlays of government dollars would fall by about $44 billion during this period, with the rest of the decline occurring later, according to the Congressional Budget Office. This is because outlays often lag the budget by months or years. How much flexibility will agencies have to shield some programs from cuts? The White House and federal agencies say there won't be much flexibility, in part because each program and subprogram is subject to the same "across-the-board" reductions. Sen. James Inhofe (R., Okla.) has proposed passing a law that would give agencies more flexibility in how they decide to apportion the cuts, but the White House has said that would be unworkable given the reductions that must be taken. How are government contractors affected? This is one of the biggest mysteries because it depends on how companies try to absorb the cuts or change their business models. Many defense contractors warn the cuts could hurt their businesses, but many are already seeing their business decline as the military winds down two wars and adjusts to other budget reductions. A range of companies have raised alarms about the potential impact of the sequester, but most say they have no clear sense what the precise impact would be. $85 billion? That sounds like a lot of money. How does this compare with the size of the government's budget ? The government spent $3.538 trillion in the fiscal year that ended in September 2012. So $85 billion is 2.4% of the federal budget. What's unusual about the sequester, though, is that some of the largest programs in the federal budget are exempt. That means the cuts are concentrated on a smaller pool of government programs. Depending on the agency, cuts are going to be in the ballpark of 5% and 13%, according to various estimates from government officials. If the furloughs don't begin in force until around April, doesn't the government have time to sort things out? Probably. White House officials stress that the impact will be felt in March as the cuts begin to take shape, but the actual impact is less clear. Another looming deadline is March 27. That's when funding for a number of federal programs is projected to run out. If Congress doesn't reach a deal to fund the government by then, we would face a partial government shutdown. That would mean many federal workers would no longer face just a one-day-a-week furlough. Rather, they would be sent home indefinitely. New York Times Puts Boston Globe on Block . New York Times Co. NYT -0.44%has put the Boston Globe on the market, in a move that could shrink the company to little more than its flagship newspaper. While the New York Times has had some success charging for access to its website, amassing more than 600,00 digital subscribers in less than two years, the Globe has had less luck, reporting only 28,000 digital subscribers at the end of the fourth quarter. Times Co. has sold a string of assets over the past year or so, including its regional newspapers; About Group, parent of the how-to website About.com; and a stake in the owner of the Boston Red Sox. Aside from its flagship New York Times newspaper, a sale of the Globe would leave the company with only the International Herald Tribune. Erskine Bowles was co-chairman of the Simpson-Bowles commission, and is author, with Alan Simpson, of a series of deficit-reduction plans. His most recent proposal — summarized here — came out Tuesday, and The Washington Post has an interview from that afternoon. It’s not a fundamentally new argument to say that the U.S., if it had a draft military, might be more careful about using military force and more restrained in deploying its service members. Still, it’s interesting to see McChrystal, who led the international force in Afghanistan before resigning in disgrace in 2010, making that case himself. The “reinstate the draft” argument is typically associated with liberal Democrats and with opponents of U.S. military action, not with the generals who lead that action. Bring it on: Simpson and Bowles to Offer Up Deficit Fix . The new $2.4 trillion Simpson-Bowles proposal would identify $600 billion in spending reductions through changes to health-care programs such as Medicare and Medicaid. That is roughly $200 billion more than the White House has said it is willing to accept. 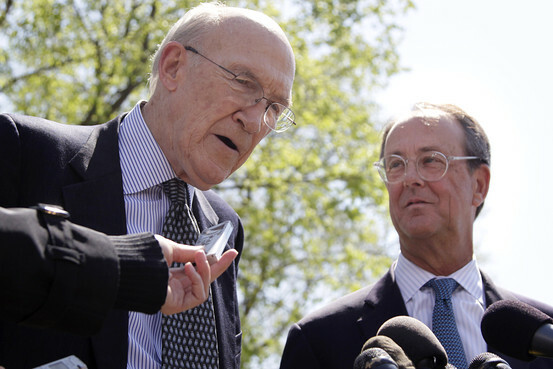 Deficit hawks Alan Simpson and Erskine Bowles on Tuesday will propose a detailed plan for rewriting the tax code and implementing deep new spending cuts, hoping to offer a path to compromise for Democrats and Republicans, according to an outline of the plan. Messrs. Simpson and Bowles co-chaired the White House's 2010 deficit-reduction panel, which put together a bipartisan package of tax and spending changes that fell flat after the administration and congressional leaders took a look. They will try once again on Tuesday, at a time when Washington budget talks have entered a particularly frosty period. Republicans and Democrats say they want to reduce the federal budget deficit but are far apart on how and by how much. Many lawmakers left Washington late last week for recess this week, having made little progress in talks to avert roughly $85 billion in federal spending cuts scheduled to begin March 1. These cuts will run through September unless Congress intervenes, something many analysts believe is becoming less likely each day. Mr. Simpson, a Republican, and Mr. Bowles, a Democrat, say their new proposal would reduce the federal budget deficit by $2.4 trillion over 10 years, more than the $1.5 trillion package that White House officials have said is their goal. Obama administration officials say any deficit-reduction package must include new tax revenue as well as spending cuts. House GOP leaders have not yet detailed the size of the deficit-reduction package they will propose, but they have said it would balance the budget within 10 years, which would put it in the $4 trillion range. They have said, though, that it won't include any tax increases. The new $2.4 trillion Simpson-Bowles proposal would identify $600 billion in spending reductions through changes to health-care programs such as Medicare and Medicaid. That is roughly $200 billion more than the White House has said it is willing to accept. The health-care component is perhaps the most detailed of any part of the package, according to a description, calling for "improving provider and beneficiary incentives throughout the health care system, reducing provider payments, reforming cost-sharing, increasing premiums for higher earners, adjusting benefits to account for population aging, reducing drug costs, and getting better value for our health care dollars." Another $600 billion in deficit-reduction would come from curbing or ending a number of tax breaks. This is about in line with the level of increased revenue White House officials have said they are seeking, but most Republicans have said they won't accept any tax increases as part of a deficit-reduction package. The final $1.2 trillion in the proposal would come from lower caps on discretionary spending—the type Congress approves annually—changing the way cost-of-living increases are calculated for Social Security checks and other government benefits, cuts to farm subsidies, and changes to military and civilian retirement programs, among other things. The package marks at least the fourth effort by Messrs. Simpson and Bowles in the past three years to galvanize public and political backing for a deficit-reduction deal. It follows their late 2012 attempt to broker a large-scale agreement between the White House and congressional leaders during the talks over avoiding the so-called "fiscal cliff." Messrs. Bowles and Simpson helped assemble a large group of chief executives to prod Washington to act, but that effort gained little traction as political leaders dug in and many CEOs threw up their hands. In the past, their pitches have proven more popular with rank-and-file members looking to support a bipartisan plan than with congressional leaders who were locked in negotiations. The Simpson-Bowles proposal says political leaders should strive to push the ratio of federal debt as a percentage of gross domestic product to less than 70% over 10 years. The Congressional Budget Office earlier this month said this ratio is likely to be 77% by 2023 if no further actions are taken. This is historically very high and could lead to high interest payments for the U.S. government, among other things, particularly when interest rates rise. The spending cuts set to begin March 1 resulted from the 2011 agreement that raised the federal borrowing limit. They would reduce spending in areas including defense, housing, education and transportation. They represent just a small slice of the government's annual budget, which exceeds $3.5 trillion, but big-ticket programs like Social Security and Medicare benefits are immune from the cuts. Senator Mike Johanns, a Nebraska Republican who is in his first term, is joining another Republican, Saxby Chambliss of Georgia, and three Democrats — Tom Harkin of Iowa, Frank R. Lautenberg of New Jersey and John D. Rockefeller IV of West Virginia — in heading for the exit. Senator Mike Johanns, a Nebraska Republican who is in his first term, announced on Monday that he would not seek re-election next year, the fifth lawmaker to bow out of a Senate that has become increasingly polarized and dysfunctional. Mr. Johanns, a soft-spoken former Nebraska governor and agriculture secretary in the George W. Bush administration, appeared well positioned to be re-elected and was not on any Democratic target list. But last year, he angrily criticized conservative groups that tried to step in and influence the Senate election in his state. And his efforts as part of the “Gang of Eight” to broker a bipartisan accord on deficit reduction proved fruitless. Nebraska’s other Senate seat came open last year with the retirement of a Democrat, Ben Nelson. And despite the return of former Senator Bob Kerrey as the Democratic candidate, a relative political newcomer, Deb Fischer, cruised to victory as a Republican standard-bearer. Mr. Johanns is joining another Republican, Saxby Chambliss of Georgia, and three Democrats — Tom Harkin of Iowa, Frank R. Lautenberg of New Jersey and John D. Rockefeller IV of West Virginia — in heading for the exit. With former Senator John Kerry’s move to secretary of state, the rash of retirements will hasten a wholesale makeover of a Senate that was once far more stable. To the U.S. government, Presidents’ Day is still recognized as “Washington’s Birthday,” though in some states the day jointly honors the birthdays of Washington, born Feb. 22, and Abraham Lincoln, born Feb. 12. And in other states the day is meant to honor Washington and Thomas Jefferson but not Lincoln — or all of the presidents. 5) Name all six presidents with the first name of James. 6) Who served as president with a musket ball stuck in his shoulder? 7) How old was Abraham Lincoln when he was assassinated in 1865? 8) Who was the first president to be seen on television? 9) Four presidents were assassinated. Six survived assassination attempts. How many can you name? 10) Which two presidents said they saw an unidentified flying object? 1) a. Martin Van Buren, the 8th president. The previous presidents were born as British subjects. 2) a. George Washington. He was inaugurated in New York City on April 30 but before he left his native Virginia he had to borrow money from a neighbor to pay off his debts. 3) d. Teddy Roosevelt was the youngest serving president, assuming the job at the age of 42 in 1901 when president William McKinley was assassinated. Kennedy, at 43, was the youngest to be elected, in 1960. 4) a. William Howard Taft, the 27th president president, from 1909–1913, served as chief justice from 1921-1930. He was also dean of the University of Cincinnati Law School and U.S. secretary of war. 5) The six Jameses: Madison, Monroe, Polk, Buchanan, Garfield and Carter. 6) c. James Monroe, who dropped out of college at age 18 to fight in the Revolutionary War. On December 25, 1776, Monroe crossed the Delaware and led a charge at Trenton, getting wounded in the battle. He was hit in the left shoulder with a musket ball, which cut his axillary artery. Doctors tried to remove the musket ball but couldn’t, and he lived with it for the rest of his life. 7) d. Lincoln was 56 when he died on April 15th, 1865. 8) b. Franklin Roosevelt, on April 30, 1939, at the opening of the World’s Fair in New York. Carter spoke years about the 1969 incident years later. “”It was the darndest thing I’ve ever seen. It was big, it was very bright, it changed colors and it was about the size of the moon… We watched it for ten minutes, but none of us could figure out what it was. One thing’s for sure, I’ll never make fun of people who say they’ve seen unidentified objects in the sky.” Reagan told a Wall Street Journal journalist that he was in a small plane in 1974 when they spotted a UFO. Jerome Gray, a 74-year-old black man, has voted in every election since 1974 in this verdant little outpost of some 4,000 people halfway between Mobile and Montgomery. Casting a ballot, he said, is a way to honor the legacy of the Voting Rights Act of 1965, a civil rights landmark born from a bloody confrontation 70 miles north of here, in Selma. The franchise remains fragile in Evergreen, Mr. Gray said. Last summer, he was kicked off the voting rolls by a clerk who had improperly culled the list based on utility records. A three-judge federal court in Mobile barred the city from using the new voting list, invoking Section 5 of the Voting Rights Act, which requires many state and local governments, mostly in the South, to obtain permission from the Justice Department or from a federal court in Washington before making changes that affect voting. That provision is also at the heart of one of the marquee cases of the Supreme Court’s term, Shelby County v. Holder, No. 12-96, which will be argued on Feb. 27. It was brought by Shelby County, near Birmingham, and it contends that the provision has outlived its purpose of protecting minority voters in an era when a black man has been re-elected to the presidency. Congress was entitled, the court went on, “to limit its attention to the geographic areas where immediate action seemed necessary.” Lawmakers chose the areas to be covered based on a formula that considered whether they had used devices to discourage voting, like literacy tests, and data from the 1964 election. The court in Mobile this month said the case before it, concerning Evergreen, was simple: because the city had not obtained preclearance from federal authorities, it could not revise its voting list using utility records. Nor could it use a municipal redistricting plan enacted by the City Council that had concentrated black voters, who are in the majority, into just two of the five districts, limiting black voting power. It is not clear when the municipal election, originally scheduled for last August, will be held. Critics of the Section 5 preclearance requirement call it an unwarranted and discriminatory federal intrusion on state sovereignty and a badge of shame for the affected jurisdictions that is no longer justified. The problem, he said, is that the provision applies in only some parts of the country. “I think it’s discriminatory because it picks on us Southerners,” he said. Congress has repeatedly renewed the law, and for a while it used fresher data with each renewal. But when Congress renewed the law for 25 years in 2006, it made no changes to the list of jurisdictions covered by Section 5 and used data from the 1972 election as a baseline. The law applies to nine states — Alabama, Alaska, Arizona, Georgia, Louisiana, Mississippi, South Carolina, Texas and Virginia — and to scores of counties and municipalities in other states. In 1990, Latinos made up 30 percent of the state’s population; they will make up 40 percent — more than any other ethnic group — by the end of this year, and 48 percent by 2050, according to projections made by the state this month. This year, for the first time, Latinos were the largest ethnic group applying to the University of California system. Most political observers say California is nowhere near the end of its political transformation. The share of white voters, who tend to be older, is expected to continue to decrease, while Latinos and Asians will make up more of the electorate. As deadlines go, the March 1 sequester lacks punch. Nobody’s taxes will go up; the U.S. Treasury won’t run out of cash. Government offices won’t immediately turn out the lights and lock the doors. No federal worker will be furloughed for at least 30 days. So Washington felt little need to cancel the Presidents’ Day break. On Friday, President Obama flew to Florida for a long weekend of golf. And Congress left town for nine days, with scant hope of averting deep cuts to the Pentagon and other agencies in the short time remaining when lawmakers return. Instead of negotiating, party leaders were busy issuing ultimatums and casting blame. Before they left, Senate Democrats unveiled a bill to replace the sequester in part with new taxes on millionaires, which Republicans oppose. And House Speaker John A. Boehner (R-Ohio) vowed “the sequester will be in effect until there are cuts and reforms that put us on a path to balance the budget in the next 10 years,” an idea Democrats oppose. Behind the scenes, there was real concern that the cuts eventually would disrupt critical government functions, hamper economic growth and destroy 750,000 jobs. But for now, the sequester is amorphous and slow-moving, and it has emerged as a convenient hill on which to plant a flag and fight the next battle in the ongoing partisan conflict over taxes and spending. Even as Boehner refused to draft legislation to avert the sequester, he was looking for ways to avoid a government shutdown at the end of next month, an event that would have more immediate and spectacular consequences. In a meeting Thursday with Senate Majority Leader Harry M. Reid (D-Nev.), Boehner suggested quick action to fund the government through the rest of this year, according to people in both parties. The current funding bill runs out March 27. Boehner spokesman Michael Steel declined to comment, saying House leaders have not decided how to proceed. But an agreement to keep the government open would let everyone breathe a sigh of relief until August, when the next serious deadline — another increase in the federal debt limit — will once again loom. In the meantime, lawmakers began bracing for the sequester to creep ever so slowly into people’s lives. This week, a host of Cabinet secretaries wrote letters and trooped to Capitol Hill hearings to warn that the impact will indeed be calamitous. None of it, however, would happen right away. At a hearing Thursday, Senate Appropriations Committee Chairman Barbara A. Mikulski (D-Md.) begged a panel of top officials to give her more urgency and drama. Well, no, said Daniel Werfel, controller at the White House budget office. But there will be “intense bargaining with unions” about furloughs. Word will go out to federal contractors about contract modifications and terminations. And “governors will be digesting information about how their financial footprint will be impacted. The list goes on and on,” he said. “And I think it could turn into a firestorm,” offered Mikulski, whose state is home to roughly 300,000 confused and dispirited federal workers. While the Washington region is likely to be hardest hit, Sen. Mark R. Warner (D-Va.) said the rest of the nation will soon feel its share of pain if the sequester hits. Republicans were, for the most part, unmoved, noting that they see no reason to acquiesce to Democratic demands to replace spending cuts in part with new tax revenue. After all, “the president last month got an enormous amount of revenue with no spending cuts. Now he’s going to get cuts with no revenue,” said Rep. Tom Cole (R-Okla.), a senior Republican on the House Budget Committee, referring to the Jan. 1 “fiscal cliff” deal to raise taxes on income exceeding $450,000. The sequester would cut spending by $1.2 trillion over the next decade. It was adopted during the 2011 debt-limit showdown and designed to be so painful that neither party would ever let it take effect. During the next seven months, it is slated to slice $85 billion out of agency budgets — including $46 billion from the Pentagon — with the cuts applied equally to every program and account, no matter how worthy. The Pentagon cuts remain problematic for many Republicans, however, and House Appropriations Committee Chairman Harold Rogers (R-Ky.) is working on a government funding bill that would make it easier for the military to handle the cuts by permitting it to shift money among accounts. But Senate leaders are unlikely to accept such a bill, saying it would trigger a rush by Democrats to protect other agencies. Aides in both parties say Reid has urged Boehner to pass a simple government funding bill with no special provisions for any agencies, an idea Boehner is considering. Senate Democrats, meanwhile, are pressing ahead with their plan to replace the sequester for the rest of this year, in part with higher taxes on millionaires. But in the unlikely event that the bill were to pass the Senate, it would probably die in the House. Without a compromise to stop the sequester, some lawmakers are considering a fallback plan that would give agencies more flexibility to decide where the cuts would land. But the White House has argued strenuously against that idea, which has also split Republicans.